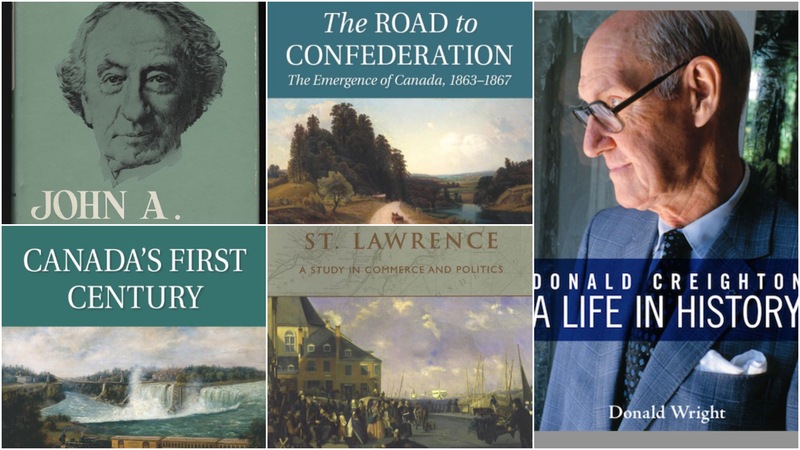 Donald Wright’s Donald Creighton: A Life in History is a splendid biography of one of English-speaking Canada’s greatest historians. The objective of this essay, which draws on Wright’s book, is twofold. First, it seeks to illuminate major aspects of Creighton’s writings on northern North America before the consolidation of Confederation, including the importance of the St. Lawrence River; the statesmanship of John A. Macdonald; and the creation of a strong central government. Second, the essay aims to assess both the differences and the similarities between Creighton’s conception of early Canada and contemporary understandings of northern North America before the late nineteenth century. In short, it endeavours to shed light on Creighton’s early Canada and ours. Creighton’s first book, The Commercial Empire of the St. Lawrence (1937), conveyed his belief that the only waterway capable of linking the resources of the North American interior with the markets of western Europe was integral to Canada’s development. Written with the dramatic flair that characterized much of Creighton’s work, the book chronicled the fortunes of a Montreal-based mercantile community between its formation in the aftermath of the Conquest and its irreversible decline roughly a century later following Britain’s adoption of free trade. While, as Wright points out, Creighton’s interpretations were not entirely original – Marion Newbigin had already portrayed the St. Lawrence as instrumental to North American colonization, while Harold Innis had already argued that Canada’s economy developed not in spite of its environmental circumstances but because of them – he combined existing interpretations with new discoveries in a grand synthesis that was as eloquent as it was ambitious. So compelling was Creighton’s narrative that Frank Underhill praised it as “the best book ever written” in Canadian history! Creighton’s reputation as one of Canada’s leading historians was cemented with his two-volume biography of John A. Macdonald (the first volume, The Young Politician, was published in 1952; the second volume, The Old Chieftain, was published in 1955). Creighton sought to dispel the belief that the Dominion’s first Prime Minister had been little more than an unscrupulous opportunist. In contrast to such unflattering interpretations, Creighton portrayed Macdonald as a broad-minded nation builder who was indispensable to the realization of Confederation, the crafting of the National Policy, and the completion of the Canadian Pacific Railway. For Creighton, Macdonald was largely responsible for creating a new Laurentian empire, albeit with the support of a nurturing Britain that sheltered Canada from American encroachment. While the Montreal merchants’ sphere of influence had collapsed, Canada’s first Prime Minister helped lay the groundwork for another expansive entity – the Canadian Dominion – centred on the St. Lawrence through his prudent, pragmatic leadership. 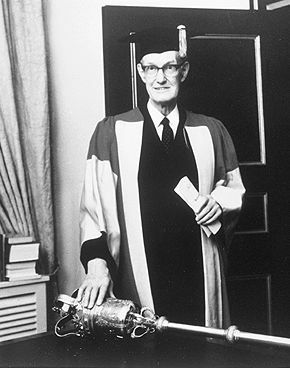 Donald Creighton, Receiving an honorary degree, 1974. In addition to burnishing Macdonald’s reputation, Creighton’s study of “Old Tomorrow” marked an important step in the evolution of Canadian historiography. Where older biographies of major figures in Canada’s political history had tended to be fusty and fixated on constitutional minutiae, Creighton strove to invigorate his subject by emphasizing Macdonald’s humanity. Influenced by members of the Bloomsbury Group who had rejected Victorian stodginess and revolutionized biographical writing overseas, Creighton took pains to explore Macdonald’s private tragedies – the murder of his older brother, the chronic illness of his first wife, the premature death of his first son – alongside his public triumphs. Thus, in addition to providing a thorough account of Macdonald’s career, Creighton’s depiction of the Dominion’s first Prime Minister exhibited a “human touch” that differed sharply from older contributions to the genre of Canadian political biography. Bound up with Creighton’s belief in the importance of the St. Lawrence River and the leadership of Macdonald was his conviction that the Fathers of Confederation had created a central government that was to be far more powerful, constitutionally, than its provincial counterparts. This belief, which entailed a rejection of decentralized federalism, found expression in Creighton’s The Road to Confederation (1964). As Wright notes, this book surveyed terrain – including people like Macdonald, issues like political deadlock, and events like the Charlottetown Conference – that had already been covered in works discussing aspects of British North American union, including ones previously authored by Creighton. Still, The Road to Confederation was a significant scholarly accomplishment, in large part because it encapsulated his unequivocal belief that, while the federal government should be responsible for “the great national tasks of the future,” the provinces should be responsible for “simple, inexpensive, and unostentatious little affairs.” Forcefully articulated in The Road to Confederation, Creighton’s “centralist” view of Confederation has proven highly influential – indeed, while it is by no means unchallenged, his constitutional understanding endures as one of the most influential historical interpretations of Canada’s federal structure. For all their influence, Creighton’s views on early Canada differ substantively from those of contemporary scholars. Although there are undoubtedly other examples, this discrepancy is perhaps nowhere more evident than in his writings on northern North America’s Indigenous peoples. Where modern-day historians are increasingly focusing on Indigenous resistance and resiliency, Creighton insultingly portrayed native peoples as passive observers who were doomed “inevitably to dwindle away” in the face of Euro-Canadian initiative. For example, in The Commercial Empire of the St. Lawrence, he wrote that, “White settlement had conquered the [Laurentian] empire… [while] the Indians had been driven before it, driven irresistibly through defeat and shame toward their final degradation [on reserves].” Additionally, according to Creighton’s single-volume survey, Dominion of the North (1944), the Aboriginals’ decisive defeat occurred in 1885, when the Canadian state quashed the Northwest uprising led by Louis Riel, a “half-breed megalomaniac,” although not before Big Bear and Poundmaker had “terrorized the valley of the North Saskatchewan.” (Such remarks reveal that Creighton was apt to denounce people whom he saw as impediments to progress; as Wright explains, this tendency helps to account for his criticisms of French Canadians, whom he often caricatured, à la Francis Parkman, as irredeemably feudal.) In addition to differing from contemporary historians, Creighton’s racist depictions of natives differed from several of his scholarly contemporaries – including Diamond Jenness and Alfred Bailey – who were beginning to acknowledge such themes as European explorers’ dependence on Indigenous peoples, and the devastating effects of colonialism. Arguably, though, there are ways in which Creighton’s views on early Canada mesh with those of twenty-first-century historians. Consider his attitudes toward the environment. Once described as “one of the half-dozen best historians in the English-speaking world,” Creighton is a towering figure in Canadian historiography. As Wright demonstrates in his superb book, Creighton’s works shed valuable light on northern North American history, including the significance of the St. Lawrence, the life of Macdonald, and the nature of Confederation. Among other things, his writings reveal the existence of both differences and similarities between Creighton’s early Canada and ours. 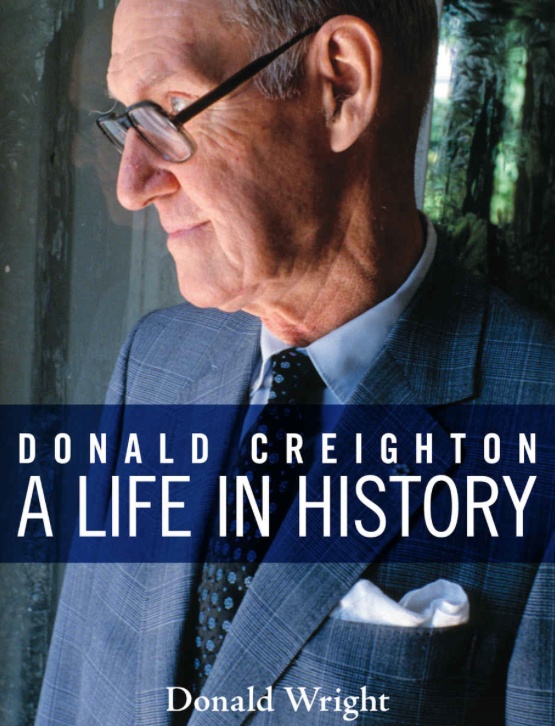 Donald Wright, Donald Creighton: A Life in History (Toronto: University of Toronto Press, 2015), 130. Carl Berger, The Writing of Canadian History: Aspects of English-Canadian Historical Writing Since 1900, Second Edition (Toronto: University of Toronto Press: 1986), 218-222. Wright, Donald Creighton, 267-271. Differing perspectives on Confederation include A.I. Silver, The French-Canadian Idea of Confederation, 1864-1900 (Toronto: University of Toronto Press, 1981); and Paul Romney, Getting it Wrong: How Canadians Forgot their Past and Imperilled Confederation (Toronto: University of Toronto Press, 1999). See, for example, Kathryn Magee Labelle, Dispersed but Not Destroyed: A History of the Seventeenth-Century Wendat People (Vancouver: University of British Columbia Press, 2013). Wright, Donald Creighton, 131-132; 159-160. Sean Kheraj, “Restoring Nature: Ecology, Memory, and the Storm History of Vancouver’s Stanley Park,” Canadian Historical Review 88, no. 4 (December 2007): 582-583. Indeed, Daniel Macfarlane has written that Creighton was inspired “[by] the idea that the [St. Lawrence] river determined Canada’s historical development.” Macfarlane, Negotiating a River: Canada, the US, and the Creation of the St. Lawrence Seaway (Vancouver: University of British Columbia Press, 2014), 3.